Welcome to the Arlington Reservoir website. The Arlington Reservoir (the Res) was built in the 1870's as part of a municipal water supply system, but has served since the 1890's as a recreational area for walking, swimming, fishing and boating. A perimeter path of almost a mile is enjoyed by walkers, joggers ad bird watchers throughout the year. The total area of the Res and its shoreline is about 65 acres. Although all of the Res and adjacent land is owned by the Town of Arlington, about half of it is located in Lexington. The Res is part of the extensive watershed that connects Arlington's Great Meadows in East Lexington to the Mystic Lakes and Mystic River via Mill Brook. The Reservoir Committee of the Vision 2020 Environmental Task Group is a group of concerned citizens working to solve the Reservoir's problems. The Committee meets on the third Tuesday of the month in the Arlington Town Hall Annex. Anyone with an interest in the Reservoir is welcome to participate. >The 2018 Reservoir Annual Report can be viewed and downloaded here. >Access documents about the planning and implementation of the Reservoir Master Plan. >Committee Meetings: The first meeting of the season will take place on Tuesday, March 19 at 7:30 in the evening in the first floor meeting room of Town Hall Annex. Meetings are generally the third Tuesday of the month at 7:30 pm in the Arlington Town Hall Annex first floor. Check this space to make sure. Sometimes we skip a month. >Work days: Friday, March 22 9-12 ; Saturday, March 30, 9-12. >We would like to start a gallery of recent photos of the Reservoir and surrounding grounds. You can send us photos for posting by attaching the tif, or jpg to a email sent from the contacts form. Arlington Reservoir Master Plan Project. The Master Plan Project for the Arlington Reservoir, funded by the CPA, is underway, and it's going to be an exciting process! The firm of Weston & Sampson has been hired as the consultants on the project. More information about The Master Plan Project can be viewed on the Reservoir Master Plan Page. New Invasive Plant Management Project Next to the Res. An invasive plant management project has been initiated in the Cataldo conservation area next to the Res. (This is along the path that runs from the Res along Mill Brook to Bow Street Lexington and the bikeway.) Holly Samuels is leading this project with the approval of the Lexington Conservation Commission. More information about this project can be found on the East Lexington Community Association website. Join the Reservoir email list. 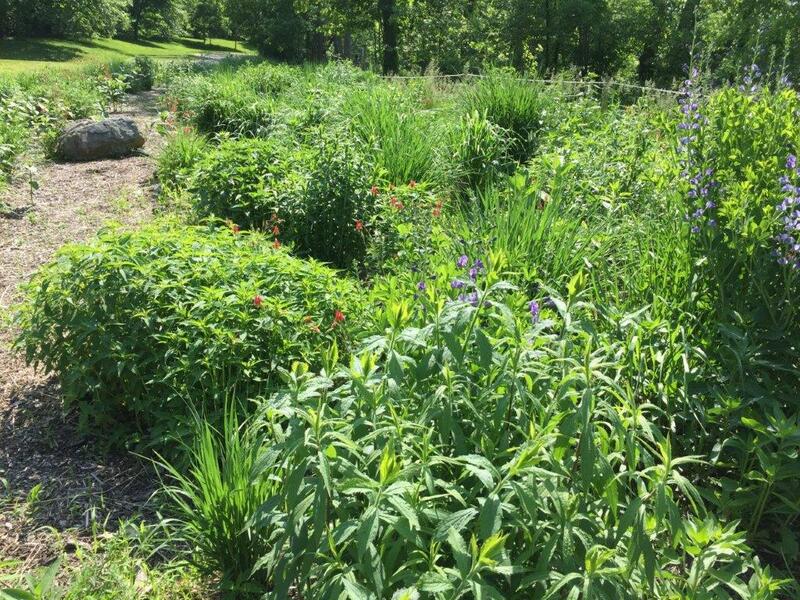 The habitat garden is planted with native shrubs, grasses and wildflowers that provide shelter and food for a wide variety of wildlife, including rabbits, turtles, toads, birds, butterflies bees, dragon flies and many other species. The successful wildlife habitat garden must provide food, water, shelter and places to raise young. Native plants provide the foliage, pollen, nectar and seeds that many species need to survive. The garden is located on the main path from the parking lot on both sides of the spillway (see map). Inspired by an anonymous donation from an Arlington Land Trust member and subsequent contributions from many other ALT members and local residents along with support from the Conservation Commission, the Wildlife Habitat Garden came to life this spring and summer after several years of planning and design work. The garden was started in 2011 and is maintained by the Reservoir Committee, a part of Arlington's Vision 2020. Financial donations to support this work at the Reservoir can be made through the Arlington Land Trust, PO Box 492, Arlington, MA 02476, or through their website. Those who wish to volunteer can contact us through the contact form on the Contacts page. 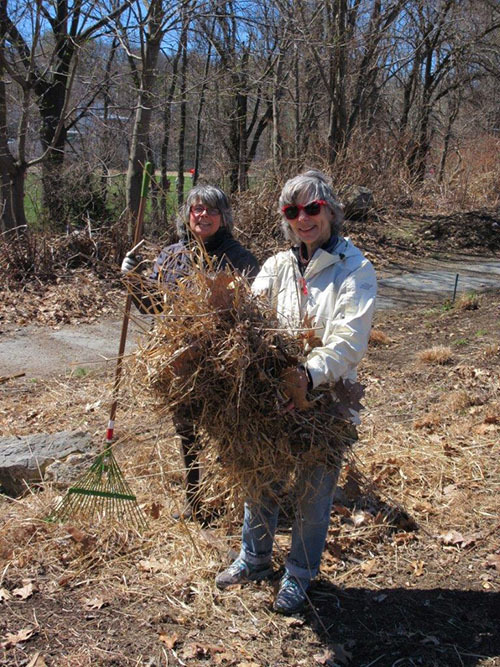 Two Reservoir Committee Members, Martine Gougault and Lisa Fredman, work on cleaning up the Garden in the early spring. We work in the Garden frequently during the growing season from April to October. Workdays are usually scheduled on the weekends but volunteers can help any time. If you wish to participate, workdays are listed on this page in the section labelled upcoming events or contact us through the contact form on the Contact Page. More pictures taken in the Habitat Garden. A special debt of gratitude is due to the Arlington Department of Public Works Department, whose staff provided critical assistance and support in many ways, initially preparing the site and especially by installing the water pipes and spigots that helped sustain the garden through the dry spells.